Pope Francis continues to preach environmentalism as he addresses crowds in Latin America, a challenging message in poor countries where over-exploitation of natural resources is a constant temptation. These are also countries and populations, however, most at risk from pollution and the ravages of climate change. Pope Francis’s proof text when he spoke at the Catholic University in Quito was Genesis 15: “The LORD God took the man and put him in the garden of Eden to till it and keep it.” Francis underlined that there are two commandments here– human beings are to till the garden, i.e. to shape their physical and spiritual environment. But, less stressed in the Western tradition, he said, is the second commandment, to “keep” or “guard” the garden. Genesis clearly envisaged human beings as keepers or guardians, both of the natural world and of one another. 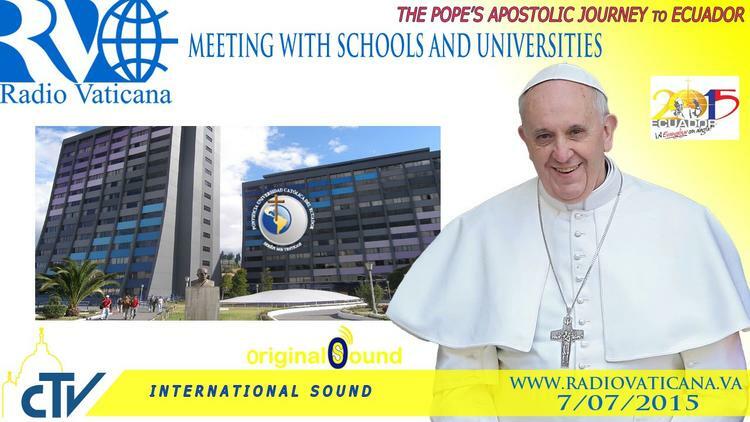 Francis pointed to the intellectual and technological potential of the university to fulfill this double charge of guardianship, and he praised the role of the youth in fulfilling it. But he stressed that abstract ideas are not enough– we must turn, he said to the concrete. Although Pope Francis was speaking somewhat abstractly here, Ecuador’s poor and its indigenous Quechua people took it that he was speaking at least partly about their marginalization. Given the pope’s encyclical on climate change and the need to move quickly away from hydrocarbons, his message is somewhat challenging for a poor country with a growing oil industry. “Between 1996 and 2008, for example, Ecuador’s glacier coverage went down by 28%. Cotopaxi, one of the most active volcanoes in the world—and one of the main sources of water for the Ecuadorian capital of Quito—saw a 30% reduction in glacier coverage between 1976 and 1997. Communities of the [pdf] Jubones river basin in the south of Ecuador are the most vulnerable to the effects of climate change. Many also feel that artificial fertilizers have caused environmental damage and are returning to composting in the traditional way. These are among the communities that Pope Francis was sticking up for. Despite its oil industry, Ecuador has a very low carbon footprint and nearly 60 percent of its energy is generated by renewables, mainly hydro. It is also, however, moving ahead with wind and solar installations, being rich in both energy sources. It may be that the young engineers and entrepreneurs at Catholic University will take away from the pope’s message a new urgency in implementing a renewable energy revolution in the country.